An engaged crowd of students, policy practitioners, and more turned out recently for a book signing and discussion. 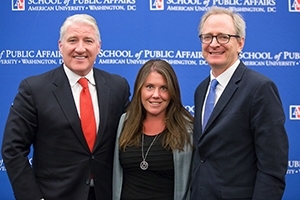 Jennifer Lawless, director of SPA’s Women & Politics Institute, and Richard L. Fox, political science professor at Loyola Marymount University, spoke about their new book, Running From Office: Why Young Americans Are Turned Off to Politics. The discussion was held on Thursday, June 18 at the Capitol Visitors Center in downtown Washington, D.C., and was moderated by CNN anchor John King. SPA covered the event live on social media. Also attending were two former members of Congress: Connie Morella and Barbara Kennelly. The book is unique in that it uses a national survey to mine the opinions of more than 4,000 high school and college students, as well as more than 100 in-depth interviews, to show that the overwhelming majority view the political system as ineffective and unappealing. The data showing young people’s apathy about politics as a career is startling, considering there are more than 500,000 elective offices in the United States, many of which serve as stepping stones to higher office. “Young people are interested in saving the world. They care about making their communities a better place. But they don’t consider electoral politics a way to achieve those goals,” said Lawless, whose book was published by Oxford University Press. In one set of questions, Lawless and Fox gave students four career options—business owner, teacher, mayor of a city or town and salesperson—and asked them which they would most like to be, assuming that each paid the same. Nine of 10 chose a career other than mayor as their first choice. Nearly 40 percent reported that it would be their least desired job. In their book, Lawless and Fox suggest five ways to get young people excited about running for office. YouLead Initiative is a national service program with the message that young people are needed to foster new leadership. Playstation for Politics is a way to engage young people on a platform where they already spend a lot of time: video games. Political Ambition—Put That in Your Bong and Smoke It proposes making political engagement – following current events and policy debates - a fundamental part of the college application experience. Girls Uninterrupted—Increase College Women’s Political Ambition would mentor and encourage young women to consider running for elected office. College men in the survey indicated they are twice as likely as college women to run for office. The Go Run App would identify all elected offices throughout the country. Users would enter their zip code and learn what elected positions are available in that community, the responsibilities associated with each and the nuts and bolts involved in running for them.